Leicester City going top, Jamie Vardy making history and Liverpool demolishing Manchester City. It has been yet another exciting Premier League weekend. Tottenham recorded a big victory over West Ham on Sunday, while Arsenal were less impressive when 'slipping' to defeat by West Brom a day earlier. Troy Deeney's last-minute own goal gave Manchester United victory away to Watford, while Chelsea recorded a first win in four league games as Diego Costa ended his seven-game goal drought. But who were the standout performers? Here are my selections. Managers, sports commentators and pundits often find themselves discussing moments that define a club's season. There is no doubt in my mind that whatever Manchester United achieve this season it could not have gone better than when David de Gea was prevented from going to Real Madrid. Since his return to first-team action he has been superb, and was the only reason Watford came away from Vicarage Road empty handed. The best bit of business United have done for years. What a difference a player makes. Since the return of Ryan Shawcross to Stoke City's ranks their captain has shut the front and back door of what was, in the early part of the season, a very porous defence. With Shawcross in the side, Stoke are becoming Fagin-like mean. Rather like the Charles Dickens character, the Potters not only gave nothing away but picked Southampton's pocket, too. Defenders are often thrown into two categories. Those that have good games, and those that don't. Well, Manchester City's home match with Liverpool threw together some of the best defenders in the league. Some were outstanding and some were awful. Martin Skrtel was in the first category and looked back to his commanding best in the absence of Mamadou Sakho. However, City's Eliaquim Mangala and Bacary Sagna looked like they had never played in the same team before. What is exciting about Liverpool at the moment is that they seem to have taken the handbrake off under Jurgen Klopp, and Skrtel looks to be enjoying the ride. Great goal, by the way. What an impressive performer Chris Smalling is proving to be for Manchester United these days. When Sir Alex Ferguson brought the young and relatively unknown player to Old Trafford from Fulham there were strong reservations about the centre-back's ability to make the grade. Not only has he become a dependable defensive figure, but a leader. His presence and stoic authority for club and country is fast becoming his greatest strength. Leicester have lost the enthusiasm and expertise of Esteban Cambiasso, but Danny Drinkwater seems to be filling the role very nicely. He's caught my eye on a number of occasions and was sensational against Newcastle. It seemed whenever the ball became available Drinkwater was there to pick up the pieces or stop the danger. Every team needs a Cambiasso and Leicester have found another. If you're an Evertonian there can be no better sight than seeing Ross Barkley mixing it up front with Romelu Lukaku. The two players are having a ball at the moment. England midfielder Barkley is now playing for Everton in an advanced position where his talents are best utilised and he is really starting to express himself as a consequence. We know how creative he can be but to see him adding goals to his game again could be the difference between Europa League and the Champions League for the Toffees. This was one of the best 30 minutes of football I have seen for ages. Manchester City didn't know what had hit them. If City looked paralysed it was because Phillipe Coutinho was inflicting the pain. The little Brazilian was magic. He taunted and provoked the former champions and at times made them look like inferior. If Leicester are top of the table right now, who is to say that in this form, Coutinho and manager Klopp couldn't lead Liverpool to the title, because I certainly didn't see this result coming. It's his first goal of the season and 250th game of his career. For Kyle Walker it's not about the stats but all about the performance and against West Ham he was outstanding. 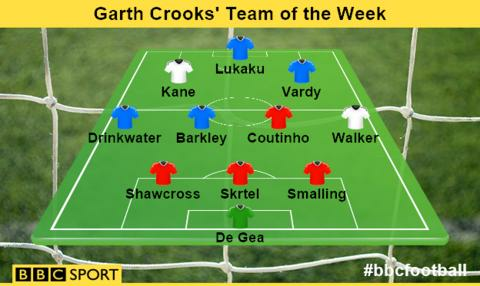 Walker has made my Team of the Week before this season, and the England defender is looking good. He's not afraid to venture into the opposition box with the ball at his feet looking for goals, even though they have been in short supply. But the way he bent the ball around Adrian with the outside of his right foot demonstrated the confidence and form the player is in right now. So he's done it. Jamie Vardy has equalled Ruud van Nistelrooy's record of scoring in 10 consecutive Premier League games. Against Newcastle the Leicester City striker looked electric and ran Steve McClaren's side ragged from start to finish - which must be a matter of concern for the Magpies boss. At the moment Newcastle look like a spent force and McClaren out of his depth. A dangerous position to find himself, especially now managers like David Moyes are suddenly available. Meanwhile, Vardy is starting to look more than just the real deal. Not bad for a lad who was playing for Fleetwood Town four years ago. It's enough to make you start believing in fairytales. Something rather special is happening at White Hart Lane at the moment. Mauricio Pochettino has got Harry Kane scoring goals again, and his side is starting to look like a team capable of winning a Champions League spot. Twelve goals for Kane in 14 London derbies is impressive. The only problem I foresee is if Kane was to pick up a long-term injury. If that was to happen Spurs will certainly struggle. Pochettino brought Kane off against West Ham once the game was in the bag and the decision was hardly surprising. His well-being is vital to Tottenham's fortunes. Lukaku reached an impressive landmark with two well taken goals against an Aston Villa side who appear to be sinking quicker than the Titanic. The Belgian now joins an illustrious group of players, like Michael Owen and Robbie Fowler, who have scored 50 Premier League goals under the age of 23. I'm not sure what that statistic tells us about the player, other than the striker can score goals. However, it would be a big mistake if, as statisticians often do, we try to equate landmarks with ability and place the Belgian in the same category as other players who have achieved this milestone, like Wayne Rooney and Cristiano Ronaldo. Now that's a different kettle of fish entirely - only winning major trophies can do that.